"Pressure? Yeah there was some pressure, I mean I didn't wanna lose to a guy with a hook." A couple of weeks ago I popped in my VHS copy of Kingpin with the sole purpose of entertainment. Between laughs I got the bug to turn this movie into some custom cards. Kingpin was made in 1996, the height of the Farrelly brothers putting out instant comedy classics, but also years past the period in time that saw me collecting every type of card I could get my hands on. I think I was still collecting basketball cards around this time but then it was all about UV coating, foil stamping, and insert sets. In other words, nothing like cards in the '80s. So, I thought I'd use the 1987 Topps baseball cards design once again. If you've read my previous posts on cards inspired by the '87 Topps you know they hold a special place with me being the first sports card wax packs I ever busted open. I thought they would make sense with the wood grain seeing as there's wood grain on a bowling alley, right? Then it dawned on me, why not replace the baseball bat grain with actual an bowling lane design?! I think that was a strike (bad pun alert). So, my customs became even more customized. "Ten frames, that's for Quakers"
Outside of the of shying away from the wood grained design in the past there was also the issue of needing some sort of logo as a part of the template. Like I did with in replacing the logo on my Sara Underwood card with baseball clip art, I added a bowling ball to fill the space. I really like the way it looks. I started making the cards that I guess you would consider "base cards". Then it occurred to me how well the movie could be lent to the different subsets that the '87 set featured, and I really started to fall in love with this Kingpin mini-set. Ish is perfect as a "Future Star" being Roy recognizes him to be a young bowling savant that he could make into a champion, the champion he himself was pegged to be in a different lifetime. Miss Claudia opportunistically joins on to help Roy co-manage Ishmael's career, and it's safe to say her business savvy is in a balance to Roy's vicarious hunger for money and glory and in helping Ish to not end up "Munsoned". So it made perfect sense to slap the "Manager" tag on her card. As a kid I loved the "Turn Back The Clock" subset. I would fantasize about how boss it would be to own not only the TBTC card, but the vintage card it featured. I never did. 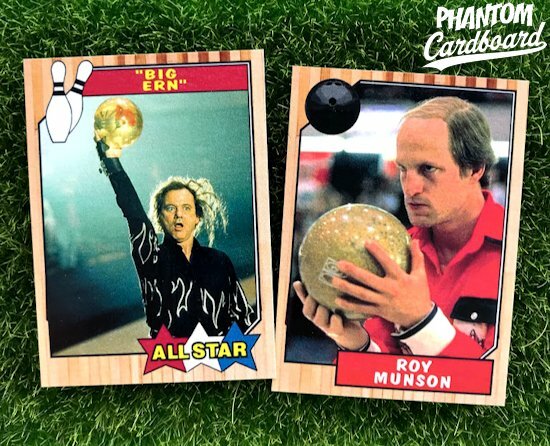 So, I wanted to "turn back the clock" to 1979 when Roy bested "Big Ern" in the 1979 Iowa Amateur Championship of bowling. Before he was "The Plastic Man", Roy was on his way to making "Munson" to bowling what DiMaggio is to baseball. I've already used the 1979 Topps basbeall design for my Warriors cards, so paying homage to Ocelot Iowa's favorite son was already halfway in the bag. Last up was the all-star subset. 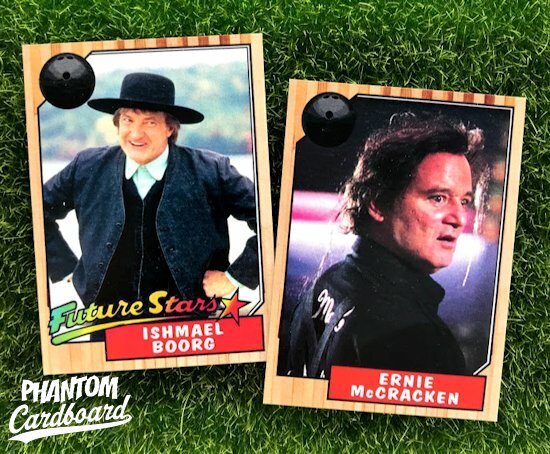 I'm not sure if there's all-stars in bowling, but if there is Ernie McCracken would be one. I mean, c'mon, he's "Big Ern"... he's the greatest!